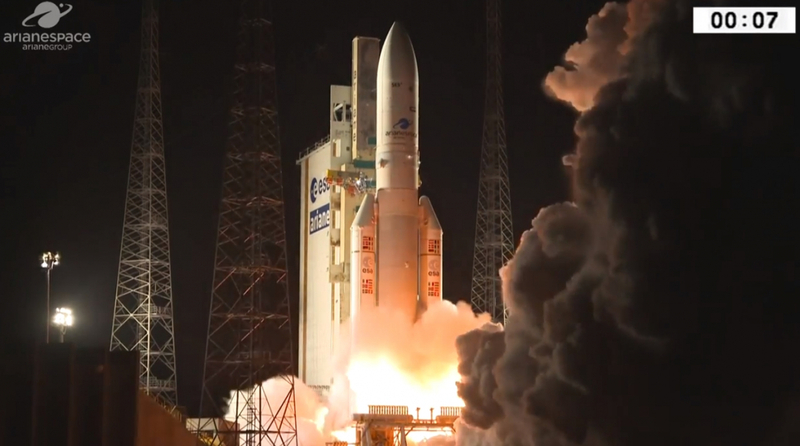 For the first time since 2002, it was feared Arianespace may have lost an Ariane 5. The rocket was tasked with launching two satellites into Geostationary Transfer Orbit (GTO). However, while the webcast continued as if nothing was amiss, contact was lost with the second stage tasked with deploying SES-14 and Al Yah-3. After an anomaly was called, pointing to a mission failure, Arianespace then reacquired the satellites. However, the orbits of the satellites are still being evaluated. The Ariane 5 ECA (Cryogenic Evolution type A) – the most powerful version in the Ariane 5 range of rockets – and was employed once again for this flight, a vehicle that is an improved version of the generic Ariane 5 launcher. Those improvements relate mainly to the structure of the Ariane 5, allowing for an increased thrust and ability to carry heavier payloads into orbit. Its modifications over the years have only enhanced its reputation and it is one of the most reliable rockets in the world, even if this latest launch is deemed a failure. Designed to place payloads weighing up to 9.6 tonnes into GTO, the rocket’s increased capacity allows the Ariane 5 ECA to handle dual launches of very large satellites. This has been the main task of the rocket over its recent years, launching two large satellites at a time. The latest mission was designated Flight VA241 in Arianespace’s launcher family numbering system. The new launch pad for the Ariane 6 rocket is taking shape at the spaceport, while the company also achieved the milestone of an engine firing of the Vulcain 2.1 engine, which will power the main stage of Ariane 6. The first test for the Ariane 6 Vulcain engine was a success! This is a version of the Ariane 5 Vulcain 2 engine optimized for Ariane 6. The latest launch was the first of a planned 14 missions this year using the heavy-lift Ariane 5, medium-lift Soyuz and lightweight Vega. Flight VA241 carried a payload estimated at approximately 9,120 kg. This total factors in the two satellite passengers’ combined liftoff mass, as well as hardware for Ariane 5’s dual-payload deployment system. Riding in Ariane 5’s upper position, SES-14 was to be deployed first in the flight sequence, with its separation occurring 27 minutes after liftoff. However, despite the webcast acting as if this had proceeded to plan, it was later revealed Arianespace was not being entirely truthful with its viewers. In fact, screenshots of the screens used by the controllers pointed to the reality of the situation. SES-14 – produced by Airbus Defence and Space for operator SES based on the E3000 EOR (Electric Orbit Raising) version of its Eurostar E3000 platform – was set to serve Latin America, the Caribbean, North America and the North Atlantic region with its C- and Ku-band wide beam coverage, as well as Ku-band high-throughput spot beams coverage. SES-14 also had a NASA-funded hosted payload for the Global-scale Observations of the Limb and Disk (GOLD) mission, which is to improve understanding of the thermosphere-ionosphere. Understanding the fundamental processes that govern our upper atmosphere and ionosphere is crucial to improve situational awareness that helps protect astronauts, spacecraft and humans on the ground. Completing the mission should have been the separation of Ariane 5’s lower passenger, Al Yah 3, which was to occur 35 minutes after the flight began. However, this milestone is also yet to be confirmed. It was at this point that Arianespace finally noted they could not confirm the milestone, leading to a shutdown of its coverage for several minutes until CEO Stéphane Israël took to the stage to confirm there had been an anomaly. Built by Orbital ATK using its new GEOStar-3 hybrid platform, the Al Yah 3 satellite was to be operated by Yahsat to provide affordable broadband communications to 60 percent of Africa’s population and more than 95 percent of Brazil’s population. The GEOStar-3 platform’s hybrid design uses traditional chemical propulsion to reach orbit in a matter of days, and then performs station-keeping operations for 15 years or more with electric propulsion, resulting in an optimum mass-efficient system. It was hoped both satellites may still be alive despite the announcement. Further information was expected during passes of ground stations as contact was attempted with the spacecraft. If this – the 241st flight using an Ariane vehicle since this European series of launchers entered service in 1979 – had failed, it would have impacted on following missions, not least flagship launches with the James Webb Space Telescope and the BepiColombo mission. However, then came the dramatic news the satellites had reported back as healthy. Although it is becoming clearer the satellites are not in their expected orbits, SES-14 will at least be able to make its way to its destination orbit thanks to its electric propulsion that will spend a few more weeks correcting its own orbital parameters. An investigation into the issues during the launch is ongoing.